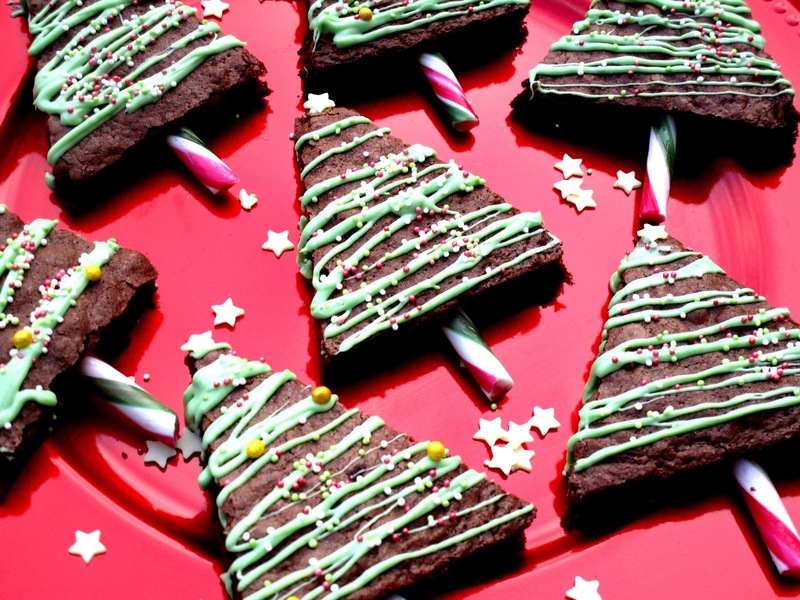 It's blogmas day 4 and today I have a baking post for you all, it's no secret that I adore to bake and when I was planning all my blogmas posts I knew I wanted a few yummy Christmas treats to be thrown into the mix so today I have my Christmas Tree Brownies recipe for you all, you can actually find quite a few different variations of this recipe on pinterest but I tweaked it and created something a little easier for me he he. 1. Melt the chocolate and butter together in a sauce pan over a low heat. 2. Once the chocolate and butter have completely melted turn off the heat and gradually stir in the sugar and eggs, it's best to let your chocolate and butter mixture cool ever so slightly first as you don't want to scramble you eggs. 3. Add the self raising flour and cocoa powder and blend with a hand whizzer until the mixture is completely smooth. 4. Pour the brownie mixture into a greased tin of choice, I actually used two circular cake tins because I thought this would be easier when cutting the triangle tree shapes. 5. Bake in the oven for around 15 minutes on gas mark 4/180C until the top of the brownies are slightly firm on top then let the brownies cool in the tin completely. 1. Once the brownies have completely cooled take them out of the tin and cute into triangle shapes to replicate trees, this is so easy if you have used round cake tins. 2. 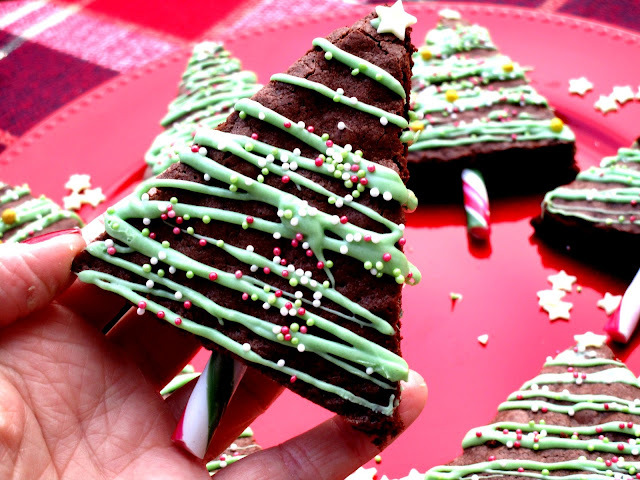 Once you have lots of triangle 'Christmas Tree' brownies you need to make their little trunks so I just chopped up some candy canes and carefully shoved them into the bottom of the brownies. 3. To ice the brownies I simply melted a bar of white chocolate in the microwave in 20 second bursts and used green food colouring gel to get my desired green colour, be careful if your using liquid food colouring instead of the gel because if you add too much liquid you can water down the melted chocolates consistency and it will be far too runny to use. 4. Pop your melted-coloured chocolate into a piping bag (I actually used a sandwich bag and just snipped off the corner) and quickly pipe the melted chocolate onto the brownies from left to right, this can be a bit messy so I'd suggest popping all your brownies on greaseproof paper first. 5. After you've piped your melted chocolate onto the brownies add as many sprinkles as you like to act as baubles and top the tree with a little star, I found some white chocolate star sprinkles in Tesco so I just used those and voila! 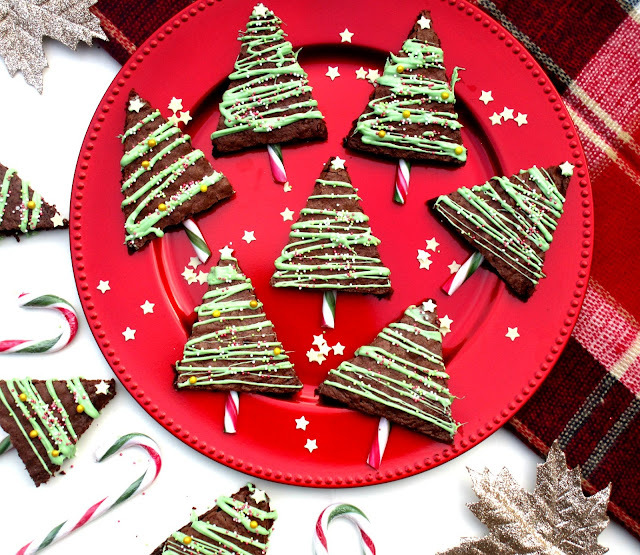 These Christmas Tree Brownies where so easy to make and I'm so pleased with how they came out, I actually surprised myself as I thought they where going to be quite difficult but actually they where so much fun to make. I'd definitely suggest giving these a whirl over the festive season, their easy, look great and taste incredible. 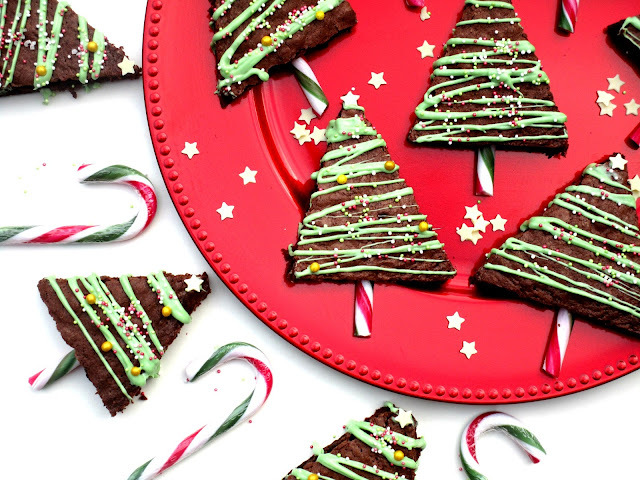 What will you be baking over the festive season beaut's? I'd love to know! They look so fab! I loooove brownies but I've never thought of making them into Christmas trees or anything - so creative! They look adorable and so yummy! I definitely want to try making these. Love how you have decorated these. Will have to try them with the little one! These actually look so cute, I have to make them right away!! Aah these look amazing! I'm going to have to have a Christmas baking day, baking these and gingerbread men! !